Less than a week til the school holidays and Easter! I'm looking forward to it, as always! I've been creating and playing today. They are my Friday Foto today. 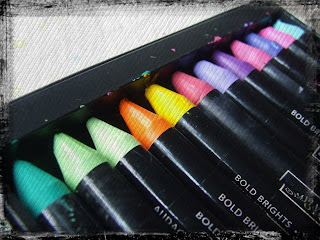 I just love these Stampin Up Water Crayons. Such vibrant colour...I love it!! Ooh yes I have to agree with you on the crayons Chelle. I love mine too, although never seem to get enough time to play with them! I bought mine in the large tin before they changed to the smaller tins in the colour families. I think thats why I don't seem to get them out enough, coz my tin always takes up more room omn my desk that is always busy as it is. Silly way of thinking lol, as when I do play with them, I looove them!!! I didn't know they had a huge tin, Shaz? ?